This skeletal driver was first seen in December of 1951 by a trucker named Roy Fitzwater. Vandalia, Ohio. The “Phantom of Route 40” is roaring down the national highway these nights—maybe along a stretch you’ve travelled on. Listen to Roy Fitzwater, 30, a Greenville, Pa., trucker. “It was spitting snow and freezing rain, and very dark one night three weeks ago. I dimmed my lights when a car approached. Five tales of the ghostly traveller have reached the State Highway Patrol here. Some truckers said the “phantom’s” car glows. Occasionally the “phantom” gets out and reveals a Halloween mask, and a skeleton suit, with bones outlined in luminous paint. Three truckers almost caught the macabre motorist a week ago. But he zoomed away, scraping his car against one of the trucks. Maybe he’s mentally ill, said a patrol officer—or maybe he’s just got a weird sense of humor. The stretch of road where the Phantom first appeared is a narrow, two-lane road atop an earthen dam. The road slopes away almost vertically. If a truck ever swerved through the railings as a skeletal driver played “chicken,” it would be a long way down. At one end of the dam was a roadhouse where many truckers gathered and told of their run-ins with the Phantom. Dayton, O., March 7. A phantom skeleton is stalking truckers along the western Ohio stretches of U.S. route 40. Truckers report actually seeing a masked motorist who wears a skeleton suit that glows in the dark. For some time they have been keeping their experiences to themselves, not wanting to draw a horse laugh from police. But they soon found more than one driver wasn’t seeing things after conversations in roadside eating spots. The phantom, according to the stories, likes to show up on the highway on stormy nights. He has been at it since before Christmas, and almost was caught once when three truckers closed in at the route 40 span over the Stillwater river. The phantom’s favorite trick is to approach a rolling truck from the opposite direction, dim his lights normally, then put them out completely. Apparently not satisfied with the attention he was getting, the Phantom drove his high-tech vehicle east to Springfield. Route 40 ‘Ghost’ Dares Sheriff to Catch Him. Springfield, O., March 14. The Phantom of Highway 40 took off his driving gloves today and picked up a pen. He wrote a letter to Sheriff J. Arthur Shuman of Clark County. The “phantom” is not one of those old fashioned ghosts that go around scaring people with just ordinary masks and glowing lights. Not the phantom of Route 40. He has gone modern. He intends to have his car “equipped with an automobile television screen so I can spot a patrol car three miles away,” the phantom wrote to Sheriff Shuman. Occasionally trucks reported the skeleton character gets out and shows a mask and a skeleton suit, with bones outlined in luminous paint. Evidently the “phantom” is feeling cocky. He dared the sheriff to catch him. The sheriff today reported receiving the letter from the elusive and macabre motorist, dated Springfield, O., March 10. The “Phantom” said he was even willing to have a midnight meeting with the sheriff. Not satisfied with luminous paint, radar, sonar and TV screens, the Phantom next experimented with smoke. St. Mary’s O. The “Phantom of Route 40,” a hard-driving spook who enjoys scaring truck drivers, popped up again today—this time behind a green smoke screen. Rex and Tom Weaver, brothers of St. Mary’s, said they’ve seen all they want of the garishly-clad ghost who appears like a will o’ the wisp on western Ohio roads. The Weavers reported they were driving on Route 40 near McCartyville when a car passed, then suddenly stopped in front of them. “We skidded to a stop and ran up to cuss out the crazy fool who was driving the car,” Rex said. Either the police were getting too close or the Phantom was bored with cruising the same old roads. He moved on to pastures new, along the Ohio-Pennsylvania border. Lisbon, O., Apparently the phantom now has developed a voice and is calling his shots. That was all. The caller hung up. Yesterday four motorists at nearby Wellsville saw a skeleton-like figure in an automobile. One man told highway patrolmen the phantom appeared to be standing on the running board. Previous the phantom was seen in other parts of the state, scaring truckers and perplexing police. And with new territory came a bold new dancing act. Steubenville, Ohio. The ghostly skeleton who danced on Route 40 may have moved to Route 7. A nervous truck driver, Louis Martel of Pawtucket, Rhode Island stopped in Yorkville, Ohio, Wednesday night to tell his story to Police Chief Roger Lollini. Martel was driving north on Route 7, which follows the Ohio River. Near a small airport, he saw an automobile approaching. It veered toward him and its lights went out. Then a figure jumped from the car. Glowing in the lights of the truck was a skeleton, topped by some sort of mask in the shape of a skull and crossbones. Road phantoms who want to roll them bones are not new, although their vehicles change with the times. 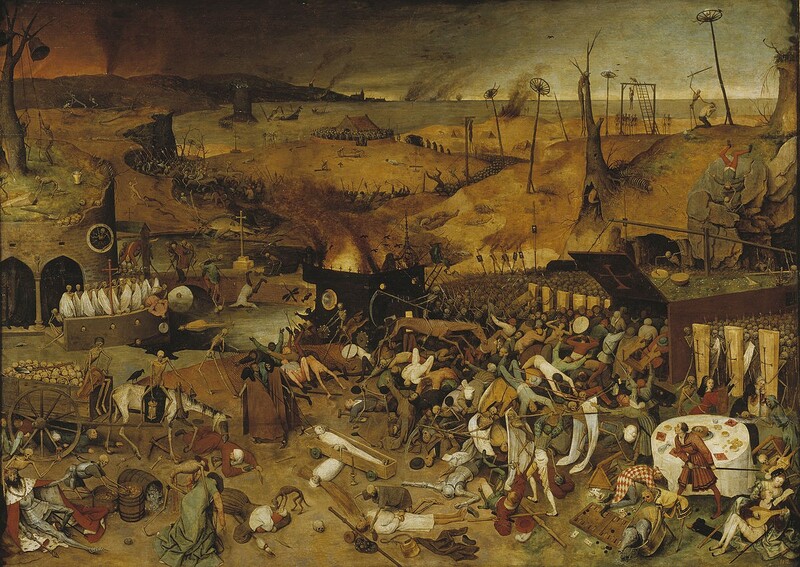 Pieter Brueghel the Elder painted skeleton wagon drivers in The Triumph of Death, c. 1562. In 1892, as I reported in The Ghost Wore Black, a “skeleton with burning eyes” driving an emigrant wagon, stampeded the residents of Richmond, Texas. There was also this bizarre story from (cue the Name Game) Devil’s Bend near Pittsburgh, PA.
Pittsburg, July 13. On Devil’s Bend, a famous curve of a favorite automobile road, near this city, the scene of a dozen or more fatalities, there appeared at midnight, it is said, a phantom auto, with two animated skeletons as occupants. The siren gave out piercing toots, dry bones rattled with the levers, and brakes were jammed hard. The mysterious auto was seen by a party of politicians who were returning from a caucus at a nearby school. They heard the report of a car coming along at a terrific rate of speed and huddled in fear, in the middle of the road for an instant. The chug-chug of the engine grew louder and the headlights suddenly rounded a curve and illuminated the pathway. Under giant trees the auto lamps made a peculiar white light. This caused the pedestrians to scatter. As they did so, all noticed that the skeleton form at the wheel released his grip for a moment, put a cigarette in his lips and lit a match. As the match was applied to the cigarette the auto was seen to skid on the fatal curve, and crash against the oak trees, which creaked and groaned. Then there was a flash and all was quiet. Seen by a “party of politicians” returning from a “caucus?” Oh, to be a fly on the wall as the politicians explained to their wives why they were so late…. Yet, Devil’s Bend did have a reputation. Here is an article on one incident. Another accident killed 6 men and 20 horses. Score of Others Injured in Accident Near Pittsburg. Columbus, Ohio. Ohio’s “Phantom of Route 40” and the garishly-clad, hooded apparition who believes in prophecy and calls himself “The End,” are crackpots and a menace to society, a state psychiatrist said recently. The psychiatrist, one of the top officials in Ohio’s mental health division who asked that he remain unidentified, said the weirdly-garbed characters who have been scaring the daylights out of unsuspecting motorists are mentally sick. “’The End’ is definitely psychotic,” he declared after reading a newspaper account of the weirdly-dressed man who appears suddenly from behind bushes in rural areas near Cincinnati with the words “The End” stamped on the hood masking his face. “This kind of behavior is diagnostic as that of a sick mind,” the psychiatrist added. “’The End’ needs treatment badly and should be hospitalized..” The state mental health expert explained the odd behavior of “The End” this way. “The writing is symbolic,” he said—“Symbolic of a mission.” He said the hooded apparition obviously has a Messianic complex. The “Phantom of 40” is another of several masked men who have been popping up like will-o’-the-wisps on state highways to harass motorists. This particular “spook” has been reported seen wearing a skeleton suite that glows in the dark like his luminously painted car. One terrified motorist told police “the thing” vanished in a cloud of green smoke, and police agree that the elusive phenomena always makes a fast getaway when his capture seems near. The early 1950s was a busy time for exhibitionist “phantoms.” 1952 also saw reports of a phantom dynamiter in Dallas, Texas and the “Blue Phantom” gunman of Illinois. Beginning in 1951, a phantom gunman terrorized Los Angeles, while the Phantom Killer of the Pennsylvania Turnpike struck in 1953. The mention above of “masked men appearing like will-o’-the-wisps,” is tantalizing, but inconclusive. I’ve not found any other masked road phantoms except “The End.” Two cases do not “several” make. The trigger-happy Illinois Blue Phantom seems to be the Route 40 Phantom’s closest rival in terms of media coverage. Other masked road phantoms causing panic 1951-1953? Accomplish your ego-satisfaction by letting me know at Chriswoodyard8 AT gmail.com. As a completely irrelevant aside, was this 1980 CBS Radio Mystery Theater episode: “The Ghost Driver,” starring Mason Adams and Norman Rose, inspired by the Phantom? Here’s the blurb: “What appears to be a skeleton driving a car forces four people to crash and die, leaving one skeptic to confront the ghost before he can kill again.” You can listen to it here. And here are the lyrics to a song about the Phantom, by Jim Colegrove. Thanks to Martha Hardcastle Guthrie for her help with this story. I’ve written about this case in Haunted Ohio IV: Restless Spirits. And this just in courtesy of the Anomalist (although I remember it from 2013), a skeleton at the drive-through. Awfully mean…. A recent addition to the skeletal driver canon: from near Wellington, Lorain County.